Well, October 22, 2011 and the day has finally come – putting on the roof! We worked so hard all spring/summer long and in 100+ degree heat to get to this day. Cant tell you the excitement I had! Now the downside, it had to be an extremely calm day to do this part. Out here in northeastern Colorado those are few to come by. Early morning is usually our best chance to get little to no wind. So we decided that this Saturday morning of October 22nd would be a great time to give the lift a chance. We had asked many of our friends to come help. There are 15 rafters on this puppy so we would need at least that many people (preferably double that on each side) to handle this project. One person on either side at about every 2 rafters should be able to hold the double plastic wall going up. Then, once up, everyone has to hold it in place while another person (in our case it was Keith – he is not so afraid of heights) goes up a ladder, starts at the center top of one end and pounds(and of course it does not just “snap” in with your fingers – NOOOO, you have to wack on the clips several times to get them to lock in the double poly-ply.) the clips in their track to hold the covers. We ended up with 8 people – thank God there was no wind when we started!! We didn’t pull out the rolled plastic until this day of installation – afraid it would have blown to the next county the day before! It’s not uncommon for us to get 10-15mph winds, but this last summer we have had several at 20+mph and even a couple at 35+mph. When it blows that hard we usually have to spend the next couple days putting our barn/shed roofs back together. One day it was so strong that it somehow managed to blow out one of our shed windows – from the inside?! Now that was freaky! So, our first job was to open and roll out one sheet, then open, line up and roll out the other on top of it. We thought about this a lot in the week prior to this day. Take up one at a time both at once? How do we raise it/them up and over the rafters? What if they get stuck up there? Should we have the scaffolding on the inside ready to go if that does happen? 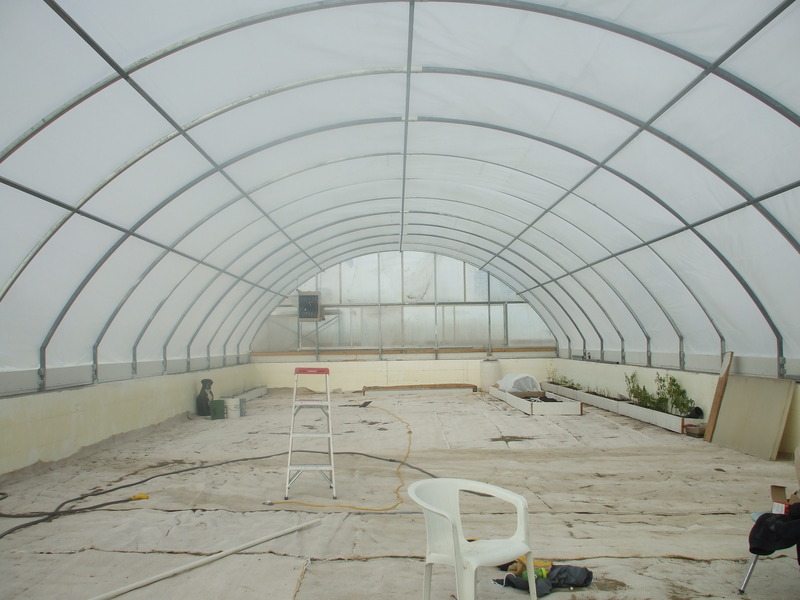 We went through a bunch of scenarios and even asked a few local plant grower greenhouse friends what they do. We were lucky there cuz one recently (in one of our great wind storms) had to do just this thing – “ropes and just pull” was their answer, oh and “make sure you have enough people” was their helpful hint. Too bad this hint didn’t help us, we were very short handed. Well, we decided to do both at one time, and we purchased a bunch of plumbing 1-1/2” PVC pipe. We duct-taped both sheets to the pipe, with just hand forcing the pipe pieces together – no glue. We also ran a 100’ rope through the pipe as we put it on. The rope was long enough to sick out both ends, so we were able to tie another long rope to each end. We then cut a small hole in the middle to tie another rope around the center. With only 3 people on the opposite side to handle the front, middle and far end – we pulled!! As the 3 people pulled, the others on the start side watched to make sure it didn’t fold or catch in a wrong place – we got really lucky cuz it just lifted right up and over!! YEA!!! Once up, it took us about a half an hour to figure out if it was squared (pull this way a bit more, nope, pull it back that way – just a bit – ha ha). Once we were sure it was a squared off as we could get, Keith quickly got up on the south end center and started hammering down the brackets into the tracks (rubber hammer of course – don’t want to damage a track or you are really screwed). After that was all secured – he started on the north end top center. That was when the wind decided to show up! Pretty sure that Mr. Wind decided that it was time to have some fun with us, and didn’t just grab both layers to keep it even and straight – nope, he had to sneak in between the layers and really screw with us! (oh, and of course the wind is a “he” – all the guys I know love to rip stuff apart, but are never around to put it back together – extra giggles on this one!!!). When we had several places tacked down on the south, north, and east I asked our friend Carrie to get some pictures. Check out under our butts and what the kids are standing on…its rolled up plastic and by the wheelbarrow you can see the pipe sticking out on from it on the ground. The plastics were larger than our structure by quite a bit – thank God again!! The hung over the north and south ends by at least 2 feet (you can see the corner south end where I am sitting. ), and along each side by at least 4-5 feet – this was a very VERY good thing since it was now about 9:30 and the wind was kicking up good. Tacking it all down took much longer than we thought. So glad Carrie was there cuz she would run to the house and get drinks for all of us and snacks for the kids (yep – had 5 grandkids there to help – 2 were mine and a bit small for the job, the 3 of Keith’s were fantastic and a HUGE help!!) – you can see how bored the poor things were just standing on the sheets. Took us till noon (I remember cuz we ordered pizza’s for everyone!) to finally get it all tacked down. We had a couple of wrinkles, but we could work on those at a later date. For now, it looked pretty darn good to us and going inside was amazing! 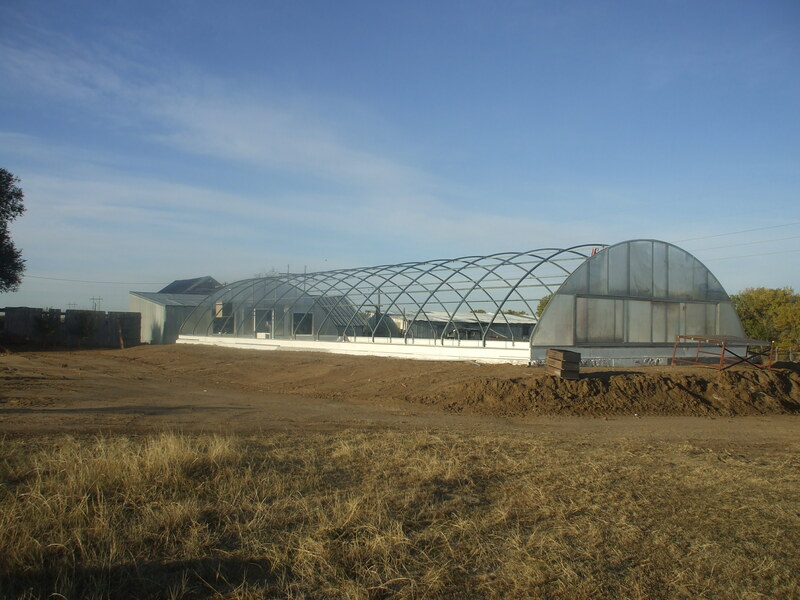 I have been in a lot of greenhouses over the years, but it’s a very different animal when you are building it yourself. We have to step down 2 steps to get into it and to look down the length with the covering on is a real sense of accomplishment!! I will never forget 2011 and doing this project, and I have the scars to prove it! It was a cooler day and the first one to notice that it was warmer inside the structure was our dog – she’s in the center of the picture against the left side wall.